In a Man in the Middle (MIM) attack the hacker places eavesdropping equipment between the sending device and the receiving device. He intercepts the data, records it and possibly modifies it, then sends it on to the intended receiving device. The attack is especially successful if neither the sender nor the receiver are aware that their data has been compromised. 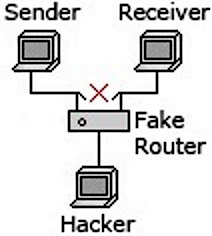 In a MIM attack the attacker might insert a fake router into the communication media. The fake router routes packets from the sender's IP address to his eavesdropping equipment. He then records the data and possibly modifies it. Then he routes the packets back to the communication media, making sure the "hop" caused by his fake router is not recorded and the source in the packets is the original senders IP address. The sender and receiver have no knowledge that their data has been intercepted. The defense against MIM attacks is to use strong data encryption. Strong data encryption requires that the encryption key be verified by a trusted third party called a Certificate Authority (CA).